Drift off to sleep in this watery scene that calls up backstroke memories and summer vacation. Weightless, floating: a swimming pool would be the ideal sleeping place. If only you had gills. Play pretend with Peggy van Neer and Erik van Loo's clever duvet and pillowcase set. Featuring a photo-quality print that's been transferred to cozy cotton threads, the watery scene utilizes depth and light to create a playful optical illusion. 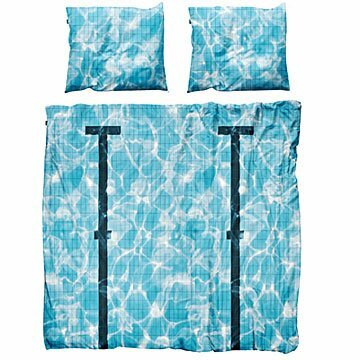 Send the set to a swimmer friend or loved one with a summer vacation mindset to inspire buoyant dreams. Designed in Amsterdam, Netherlands. Made in Portugal. Twin includes duvet cover and matching pillowcase. Full/Queen includes duvet cover and two matching pillowcases.